EPM Award’s best article poll will end soon, give your vote if you haven’t already! Submit articles to be published to next issues. TECHNOLOGY for GREEN ENERGY (TGE) seen through its Historical/Developmental point of view. You are also allowed to submit NEWS about HISTORY of SCIENCE and TECHNOLOGY or TECHNOLOGY for GREEN ENERGY. FUN PAGES contributions are welcome, too. For more info contact an Editorial Board Member (see below). How to learn more about EPMagazine. To learn more about EPMagazine you can visit our official web site (www.epmagazine.org). You are also kindly asked to take a look at our online Magazine (epmirrorsite.xoom.it) or contact our EPM Editorial Board by e-mail (see the list below on the right). 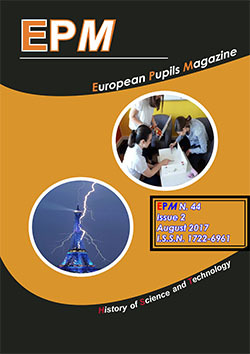 We’d like to riind you that EPMagazine (a scientific-educational periodical) has been available on some web sites for the past nine years so far and its main purpose is to improve the scientific - technological and linguistic skills of growing people by improving their abilities in reading, understanding, talking and writing about Science & Technology. There are several sections: General, 14-16 years old, 17-19 years old, Universities (19 to 24 yrs. old), Technology for Green Energy, News and FunPages. The sections 14-16, 17-19 and Universities contain articles written by students attending secondary schools and universities (aging up to 24). The General section is reserved to teachers and adult writers. Technology for Green Energy section contains contributions about renewable energy; News section contains news about scientific topics. FunPages section contains games about Science.